Yet another horse has fallen victim to the horrific cruelty involved in New York City's carriage horse industry — and we mean that literally. 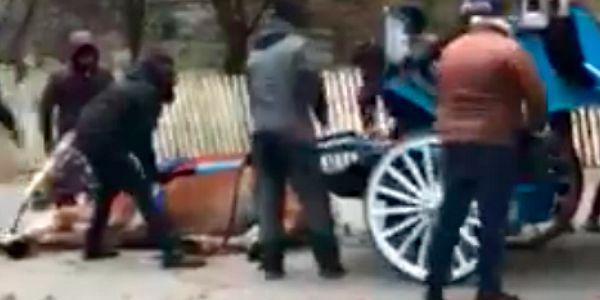 While pulling a carriage, a distressed horse recently fell down in NYC. The grim scene was captured and shared by the group NYCLASS on their Facebook page Stopping NYC Horse Abuse. Unfortunately, it's not uncommon for overworked, exhausted horses to fall down while pulling carriages. That's why we're urging the New York City Council to pass legislation to help protect the carriage horses. Sadly, NYC is one of many American cities that still allow the wholly unnecessary and completely inhumane practice of horse carriage rides to persist in spite of protests. Throughout the country, from Charlotte to Cleveland, horses are forced to pull tourists — sometimes through extreme conditions like during snowstorms, torrential downpour, and heatwaves — all the while unaware of the real cost to the horse. Recently in New York, multiple carriage horses dropped dead of colic in their stalls. And another horse collapsed while pulling a carriage in traffic. For more info, visit NYCLASS. Horse-drawn carriages are an antiquated industry, but as long as the cruelty continues, we need to do more to protect and care for the horses. Sign now to tell the New York City Council to act now.